Recently, I received an invitation to an event titled, ‘A Decade of Distinction’. It was from Tina Ambani, and the chief guest was their close family friend, Amitabh Bachchan. Initially, I was a little confused—I thought it was to felicitate Mr Bachchan. But then it would have read five decades of distinction! Tina phoned soon after and we chatted about this particular landmark celebration, which marked ten years of the Kokilaben Dhirubhai Ambani Hospital—a passion project for Tina. What an achievement! I recalled attending its grand opening and wishing her all success at the time. From the word go, it was evident just how committed and involved Tina was in ensuring world-class facilities for patients. I walked around with her, a team of doctors accompanying us from floor to floor and explaining the vision behind this ambitious project. 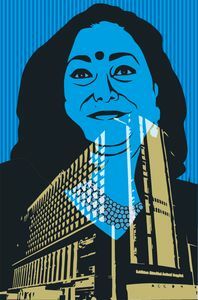 I saw Tina’s eyes gleaming with excitement as she described what had gone into creating this glittering, state-of-the-art hospital, aptly named after her mother-in-law—the matriarch of the Ambani family. I could see Tina’s husband Anil beaming with pride as he talked about the hospital being Tina’s “third child”, as her two sons hugged their mother. Surrounded by her maternal family members and close friends, Tina herself was glowing and radiant, as she congratulated her motivated team. I was surprised to note how well-versed Tina was with medical terminology, and how invested she was in every aspect of her dream project. She knew the nursing staff by name, and was aware of the latest technical breakthroughs internationally. This was not a rich businessman’s wife indulging herself with a vanity project. Oh no! Tina was the consummate corporate person—a hands-on leader, with a long-term view. Well, that ‘view’ is here! And while Tina talked with justifiable confidence in the future, as her long-time friend, I felt a surge of proprietorial pride—after all, I had known Tina since she was 16 and one of the most popular movie stars in Bollywood. Watching her walking around the hospital, so assured and informed, I looked back at her incredible life—from a Munim to an Ambani—and smiled to myself. She is a woman who has done it her way. A woman who certainly knows her priorities. Tina and I reside within one kilometre of each other in South Mumbai. It takes up to three hours in hideous traffic to reach her hospital. Tina scrupulously makes that trip to and back at least three times a week. Well, her responsibilities have just trebled with the opening of three more cancer care hospitals in Maharashtra (Akola, Gondia and soon in Solapur). Taking health care to where it is most needed—the hinterland—is worthy of applause. Yes, given our dearth of good hospitals outside the cities, Tina’s plans are indeed filling a huge gap. At 60, Tina has found her métier—she will move ahead with determination and hard work, having created a vital niche for herself through a brand patients trust and professionals recognise. This is no small achievement! Let us watch how she takes her investment in first-class medical assistance forward in an even more detailed and focused way. As for me, I feel wonderful seeing how Tina has evolved over the years. She could so easily have been just another wealthy, bored and self-indulgent wife. Instead, she chose to be a leader in a tough, challenging field and is doing an excellent job.